The Mom and Pop Culture Shop: Clown in 3-D! Artist: Or, a lack thereof. Medium: Fuzzballs and plastic face glued to yellow cardboard. And wire. Look, honey! I made something for the baby's room! I wonder if the baby is the one who smashed in this clown's face. 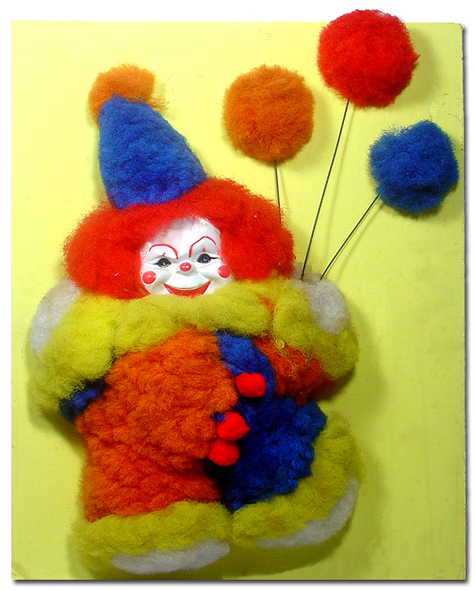 I've said it before, but nobody thinks clowns are cute anymore. Everyone is creeped out by them now. But, there once was a time when people liked clowns and thought they looked happy and I daresay, funny. Funny "ha-ha," not funny "does this milk taste funny?" And so, many a child's room of yesteryear was decorated with stuff like this. Goodnight, baby. Sleep tight.